"When you need a stand, simply fold it up to enjoy an instant stand that elevates your screen and angles your Mac for comfortable typing. Used flat, BaseLift works as a lap pad, protecting your thighs from the extreme heat and cold of your aluminum MacBook. The best part about BaseLift? It stays attached to the bottom of your MacBook all the time, so it goes everywhere your MacBook goes." The BackLift is a slim and light microfiber-lined polyurethane pad made up of a base layer with an adhesive that sticks to the bottom of any 11, 13 or 15-inch MacBook, while a secondary Smart Cover-like layer can fold into a triangular stand when you want to elevate your Mac to a more comfortable and ergonomic typing and viewing angle on the fly – all while also providing a cooler experience when using it on your lap thanks to the BaseLift's protective bottom coverage of soft and pleasant shielding. 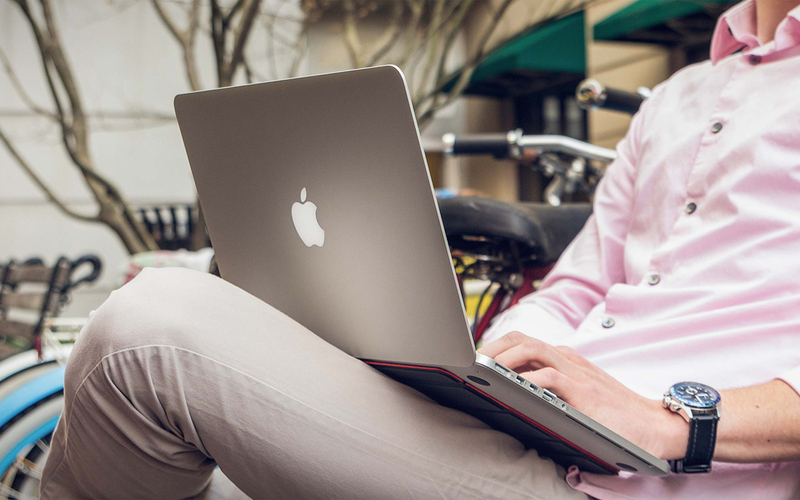 The BaseLift stand cover lays completely flat against the bottom of the MacBook where it stays closed using concealed magnets so that you’ll be able to easily slip it into your bag or sleeve. Although it was designed to seemingly be a permanent part of your Mac, the BaseLift can also be removed at any time just as easily as it is applied without leaving behind sticky residue thanks to Twelve South’s SurfaceGrip adhesive technology. Twelve South's BaseLift stand for MacBooks is available in a striking black and red colorway for $40.